It's rather relaxing to watch, which is ironic considering how violently powerful this engine can be. 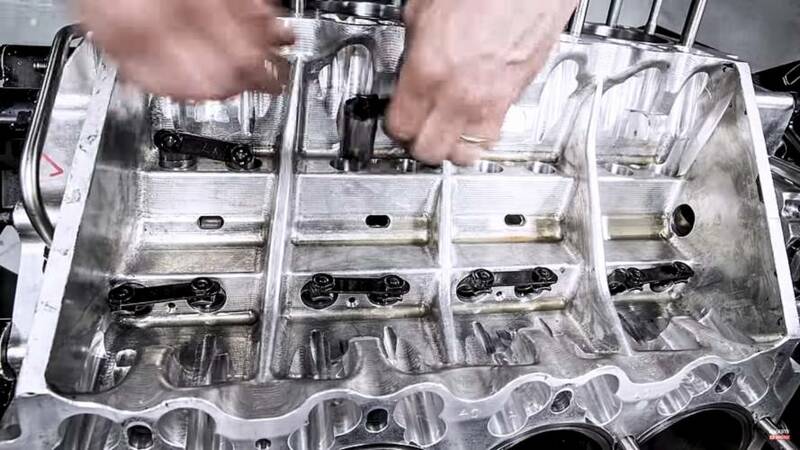 Time-lapse videos are always interesting to watch, but when the subject is something as complex as an internal combustion engine it’s even better. And this isn’t any old engine – you’re looking at the beating heart of the quickest-accelerating car on the planet. This massive nitro-fueled V8 mill is from the Top Fuel dragster of Tony Schumacher, who also happens to be the winningest driver in the history of the National Hot Rod Association’s Top Fuel category. Schumacher holds the world record for the fastest quarter-mile pass at 337.58 mph (543.15 km/h), and that should never be broken because these cars are so fast that today they only race to the 1,000-foot mark, for which Schumacher also holds the current speed record of 336.57 (541.65 km/h). At launch, his Top Fuel dragster can pull 6gs and if all goes well, he passes 330 mph (531 km/h) in around 3.6 seconds. So yeah, this is a freaking serious engine and is likely why the folks from Hagerty stopped in for a visit. Despite having such capability, it’s not a very complicated engine. It uses a simple cam-in-block design as opposed to a pair of spinning overhead camshafts, and since its purpose is to run only briefly in a straight line, it requires no accessories such as power steering like you’d find on a normal engine. It’s pretty neat to see the rough casting on the engine block, and what’s up with the blurred intake opening on the supercharger housing? It must be concealing some kind of proprietary design to help this engine make an estimated 11,000 horsepower (8,202 kilowatts). Why estimated? Because there isn’t an engine dyno in the world that can measure such power. The rebuild actually looks like a fairly simple process, but then most things look easier when an hour of work is condensed into seven minutes. Yes, it only takes Schumacher’s crew an hour to completely tear down and reassemble the engine, and that’s good because it’s such a high-strung mill that it needs such attention after every run. Then again, compared to how fast this engine sends Schumacher down the track, an hour seems like an eternity.